It took a long time, but I don’t think about Down’s syndrome every day any more. And I don’t see it any more either. I just see Ella. I know that won’t be the same for other people who see her or meet her. No matter how I see my girl, the fact she has Down’s syndrome will always be the first thing most people will notice about her. Yet, the fact other people see Down’s syndrome first is not in itself a bad thing. It is after all a big part of who Ella is. As I’ve said before, it doesn’t define her or what she is capable of, but it will always be there and will always be noticeable to others. If someone has a broken leg and is wobbling around on crutches with their leg in plaster, chances are you’re going to notice their broken leg before you get the measure of the rest of them. The difference comes in how an outward disability or injury is then perceived by others. I’ve found that Ella is so easily put into a box by most people as soon as they meet her. And yes, she can be all of those things some of the time but at the moment she is mainly just a stroppy, stubborn three year old with a fierce defiant and independent streak. Like anybody else, she has likes and dislikes, her own little quirks and a wide range of emotions. She takes toys away from her sister, has a slight obsessive compulsive need to shut doors and has a special ability to seek out the one person sat on their own in any given social setting and start ‘chatting’ to them (whether they like it or not). So, I’ve learnt through experience that there is a need to banish the misconceptions and stereotypes and to reinforce the fact that everyone is unique despite their outward appearance, whatever that may be. I came across the ‘Lose the label’ campaign on Facebook a while ago. Beautiful pictures of children and adults with Down’s syndrome all with the same simple yet powerful phrase added to them. The pictures show children playing, dancing, walking, crawling, smiling, laughing, enjoying hobbies and holidays, crafts and sports. The campaign is about seeing and putting the person first, not their disability or syndrome. Ella is not a ‘Down’s child’ or a ‘Downs’. Neither is she a ‘sufferer’ or ‘victim’ of Down’s Syndrome. A million and one things before she is a child with Down’s Syndrome. View the ‘Lose the Label’ facebook page here. 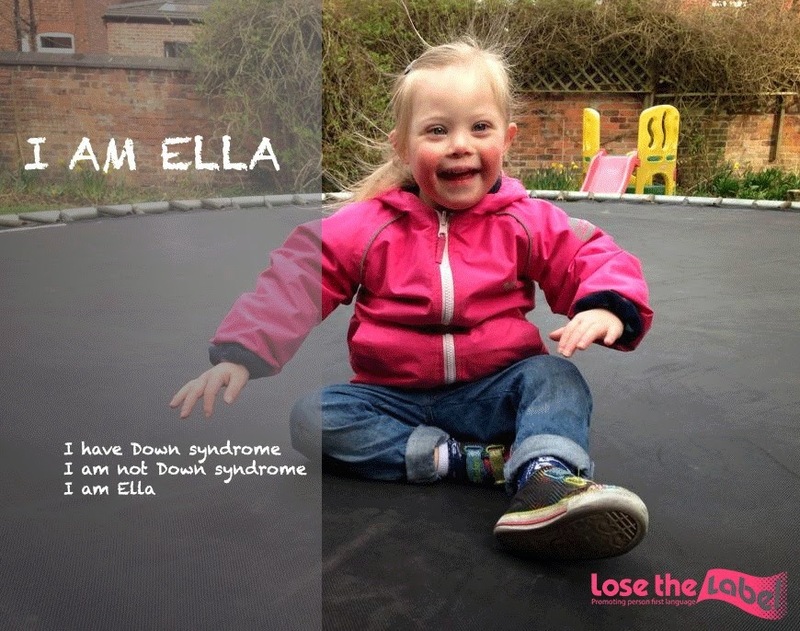 Follow the campaign on twitter – search for @Lose_the_label.